An easy way to enjoy authentic Korean bibimbap in the comfort of your home! Simply boil in bag, mix with warm rice, and enjoy. The tare sauce that comes in this item is seasoned with doubanjiang, gochujang, and chili pepper, creating a spicy flavor that can serve to increase appetite. Bibimbap is a Korean rice bowl dish that can be made with various kinds of ingredients. Often, ingredients that are five particular colors are used (black or another dark color, green, orange, white, and yellow) to represent five directions (north, east, south, west, and middle) and five parts of the body. Our bibimbap ingredients include beef for the dark color, spinach for green, carrots for orange, and soybean sprouts for yellow. Mix them with your favorite type of rice to add the fifth traditional color! Sugarlady’s frozen dishes are quick and easy to prepare, allowing you to enjoy your favorite foods even on the busiest of days. Place the bibimbap ingredients (still frozen, still in its bag) in an ample quantity of boiling water, and cook for about 8 minutes. Then, pour them along with their tare sauce onto about 180g of warm rice. 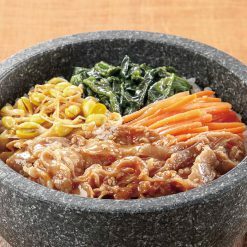 Cut the bibimbap ingredients into bite-sized pieces using kitchen scissors, mix them with the rice, and enjoy!You can also use these bibimbap ingredients to prepare a dish similar to dolsot bibimbap (“stone pot” bibimbap) by sautéing them on a hot plate or in a skillet. 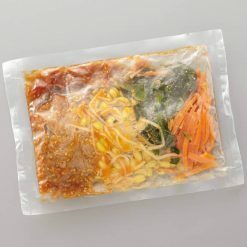 This product contains vegetables [soybean sprouts (domestic), spinach (Kyushu), carrots (domestic)], beef (New Zealand), sweeteners (starch syrup, granulated sugar, sugar), miso, sesame oil, soy sauce (contains wheat), sesame, apple juice, doubanjiang, gochujang, brewed vinegar, potato starch, table salt, pork extract, garlic paste, chili pepper, thickeners (xanthan gum, locust bean gum).. This product is not suitable for anyone with allergies to wheat, beef, soy, pork, apple or sesame. Origin of ingredients: soybean sprouts/spinach/carrots (domestic), beef (New Zealand). Prepared and packaged in Japan.